A journalist asked me this morning about one particular chart in The New Wave report - daily reading of newspapers compared to daily online activity. According to our findings, 22% of adults in South Africa go online every day or almost every day, compared to only 17% who read a newspaper daily. The message she took from this was: the Internet is becoming an important place for many South Africans - and could be or become more important than newspapers. As the journalist pointed out, this pattern that has been found in developed countries and is enough to seriously worry newspaper owners and the journalists who work for them. and But as so often with data there is more than one way to look at this information. What it also suggests is how few South Africans read newspapers often. If this was a European country, Internet use would have had to become much more pervasive to 'overtake' newspapers on this measure. My view is that doing the (social as well as economic) cost/benefit analysis of the risks to 'traditional' journalism media vs the benefits of increased access to online information sources is different in Africa than in, say the US, where writers such as Cass Sunstein in Republic 2.0 have argued that the Internet threatens the common spaces for the deliberative discussions between people with differing opinions that a functioning democracy requires. This argument rests on an assumption that mass media provides those spaces. Whether that is true in the US is one debate but whether it exists in South Africa and Africa generally is another. 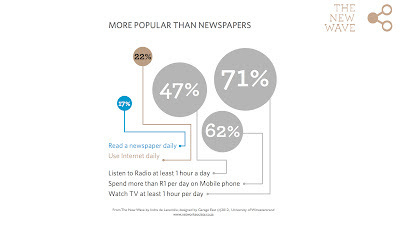 The chart shows that for most people, daily news is likely to come from television and radio - which often means the national public broadcaster. And anyone of the minority who do read newspapers everyday cannot be unaware of the many reasons to be concerned about a nation relying on that single source for the information and debate they need to be or become informed citizens of a democracy. Our research also shows that one of the main reasons people first go online is to get information, which presumably includes news - which brings me to another point about offline and online journalism. The Next Wave report is published by Wits Journalism which is part of the University of Witwatersrand. The copyright in the report is owned by the University and a copyright notice is included on the report and on all the infographics that we have published at www.networksociety.co.za. But before we published I consulted the legal department, and they agreed that we included the following notice below the copyright notice. You may reproduce the content and infographics from the report subject to providing a full credit including: ‘From ‘The New Wave’ report, written by Indra de Lanerolle, designed by Garage East © University of Witwatersrand http://www.networksociety.co.za’ and in addition, if the reproduction is online, a link to the above url. I discussed with them using a creative commons licence but even though we didn't do this, the effect of the wording is not dissimilar to a creative commons attribution licence. I've put a number of the online news reports covering The Next Wave on our Facebook page and all of them except for one have included links to the microsite where the report is freely available. We are not runnning advertising on this site, and the University is not charging for the report. But the links are important for us because they help distribute the report itself and its content. The site also includes credits for all the many partners and contributors that made this research possible and it is very important to us that all these partners and contributors are recognised. So to name and shame the one that didn't deign to provide a link, who reworked our graphics designed by an amazing team at Garage East without credit (not to mention permission). They are: BusinessTech by MyBroadband. I link to them not (in their case) for all the reasons above but also because links are a service to readers - enabling you to see sources for yourself and to get different perspectives on the story. As a small (and not very effective!) protest for the first time ever I have included a 'no follow' to the link which means that while you can use the link webcrawlers may not follow which would (if I were a very high traffic page and they were a small one) affect their page ranking. I am generally a supporter of the 'Information wants to be free' school on questions of copyright and intellectual property. I think Benkler and Lessig are right that the extreme positions on intellectual property of the US government and the content owners that lobby them, especially the criminalisation of copyright infringement are serious threats to innovation, to free debate and expression and to diversity. But for Internet freedom to work we require some good practice around acknowledgement and links. Links are not only at the heart of the business models of the web, they are at the heart of the world wide web's design. The 'H' in html stands for hypertext - the fundemental tool of the web that connects the addresses of web pages. Tech journalists covering the Internet and Internet business should know better - because its good journalism, because its a service to their readers but also because their own business and jobs depend on it. Since I wrote this blog, a number of the online news sites that are associated with newspapers have published stories about the report. I should have noticed this in their reporting before but most of them do not include links in their stories.see www.facebook.com/sanetworksociety for references. 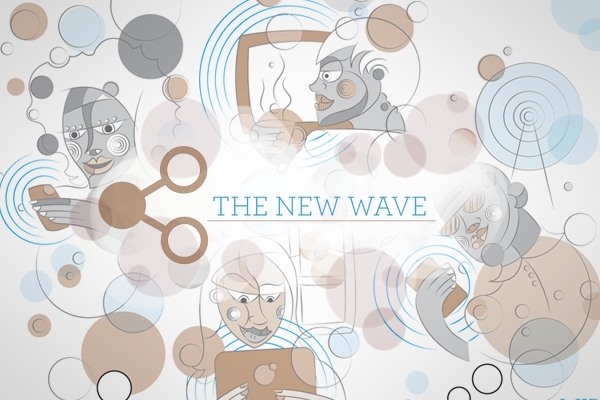 The South African online journalism is highly affected by the concept of new wave. It is visible that a lot of people in this field are heading towards this system for their ease and convenience.